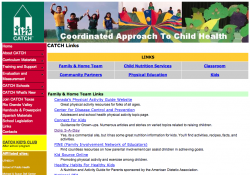 "CATCH (Coordinated Approach To Child Health) is a TEA approved Coordinated School Health Program designed to promote physical activity, healthy food choices, and prevent tobacco use in elementary school aged children. By teaching children that eating healthy and being physically active every day can be FUN, the CATCH Program has proved that establishing healthy habits in childhood can promote behavior change that carry into adulthood." "The CATCH Program focuses on coordinating four components: the Eat Smart school nutrition program, K-5 and 6-8Classroom curriculum,a Physical Education program, and a Family program. The Coordination of health messages between these four component areas is critical to positively impact children's knowledge and behavior. For over 10 years CATCH has guided schools, families, and children in the process of being healthy. CATCH, the largest school-based health promotion study in the U.S., has demonstrated that behaviors such as eating foods high in saturated fat and physical inactivity can be changed." Embark on an exciting adventure, learning about one of the seven wonders of the world: the great pyramid of nutrition. They key to success is at your fingertips as you explore the known and unknown, learning secrets to good nutritional choices. Through this wonderful opportunity, you may research, document, and design a meal plan tailored to your fitness and nutritional needs. "MyPyramid offers personalized eating plans and interactive tools to help you plan/assess your food choices based on the Dietary Guidelines for Americans." Use the information researched to establish a solid foundation of good nutrition as it pertains to you. Kidshealth.org is the #1 most visited website for children's health and development. "If you're looking for information you can trust about kids and teens that's free of "doctor speak," you've come to the right place. KidsHealth is the most-visited site on the Web for information about health, behavior, and development from before birth through the teen years.....KidsHealth is more than just the facts about health. As part of The Nemours Foundation's Center for Children's Health Media, KidsHealth also provides families with perspective, advice, and comfort about a wide range of physical, emotional, and behavioral issues that affect children and teens."